This blog page, besides the new pages and updates, will inform, review, and comment on any news-worthy activities and events on wildlife and nature in Malaysia. Watch the latest Google News here on wildlife in Malaysia. So just add and include this page in your RSS feed and get updated news automatically. Don't know where to stay in Malaysia? Find the best accommodation packages in Malaysia HERE! There are a few tiger locations in Malaysia where, if we are lucky, the malayan tigers can be seen. Continue reading "Tiger Locations in Malaysia"
The Malaysian sea turtle sanctuaries and hatcheries had, over the years, helped to revive the sea turtles population in the country. Continue reading "Turtle Sanctuaries and Hatcheries in Malaysia "
Wildlife and nature lovers will find the malaysian rivers teeming with diverse flora and fauna. See the beautiful flowers in this flowers of malaysia gallery where pictures of some of the more common species of Malaysian flowers are depicted. Continue reading "Flowers of Malaysia Gallery"
Continue reading "Malaysian Raptors Watch"
When in season, the fruits of Malaysia are in such demand that we find many cars stop by at fruit sellers manning wooden stands along highways and roads of the country. Continue reading "Fruits of Malaysia"
Malaysian bugs and hoppers belong to the interesting Hemiptera Order of Insects. Continue reading "Malaysian Bugs and Hoppers"
Malaysian mosquitoes and flies belong to the order of Diptera in the Insect world. Continue reading "Malaysian Mosquitoes and Flies"
Gunung Jebak Puyuh is a limestone hill that is extra special to botanists, naturalists and nature and cave lovers in the state of Pahang. These are the best resources and links on Malaysia's wildlife and nature. Continue reading "Best Resources on Malaysia's Wildlife and Nature"
If you take a leisurely walk in the gardens, parks or rainforests, you will most likely see some species of the amazing and lovely Malaysian beetles. The Malaysian cockroaches belong to the order of Blattodea in the Insect world. The Malaysian mantis belong to the order of Mantodea in the Insect world. And almost always we will find this insect in its typical "praying" position, hence its common name praying mantis or mantid. Malaysian Orthoptera include the grasshoppers, katydids and crickets. Continue reading "Malaysian Orthoptera, Grasshoppers, Katydids and Crickets"
The reptiles of Malaysia can be found almost everywhere in the country -- in urban and rural areas and in the rainforests-- if we look around. Continue reading "Reptiles of Malaysia"
The many state and national parks in Malaysia make for some exciting and great eco-tourism and adventure activities. Continue reading "National Parks in Malaysia"
This Malaysian Moths Gallery displays only a few of the thousands of the moth species found in the country, hoping to show their great varieties, differences and beauty. Continue reading "Malaysian Moths Gallery"
Check here for the list of the best books on Malaysian birds and the best field guides for birding in Malaysia. It is based on the general popularity and preference of the books by most birders. 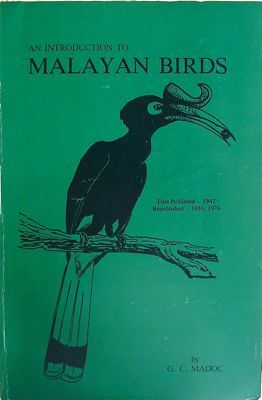 Continue reading "Best Books on Malaysian Birds"